Podcast #156 - AMD FirePro V7900 and V5900, MSI R6970 Lightning, Intel i7-990x and more! This week we talk about the AMD FirePro V7900 and V5900, MSI R6970 Lightning, Intel i7-990x,Viewer questions and more! 0:16:35 This Podcast is brought to you by MSI Computer, and their all new Sandy Bridge Motherboards! Jeremy: Remember Action Quake? How 'bout a little Action Half Life 2, still less buggy than your average commercial release and better supported. Josh: DiRT 3: Love it. This particular RAM kit is not branded SLI or EMS or Intel or any of the other theoretically targeted kits we have seen in the past, these ones are marked for use with AMD and overclockers as they use the familiar Black Edition phrase in their name. They are Patriot's G Series AMD Black Edition DDR3-1333 4GB @ 9-9-9-24 and Think Computer wanted a way to test them that would show off their abilities with an AMD system. To that end they added the AMD OverDrive Benchmark to the usual list of tests and the DIMMs performed well enough for ThinkComputers to forgive the minor packaging error they spotted. On May 11, AMD invited a handful of technology journalists and hardware reviewers to Northern Islands FirePro Tech Day to unveil a pair of new professional graphics cards – the V5900 and V7900. We were under an NDA to discuss the new GPUs at that time, but now that the gag order has been lifted, we can finally give our readers an in-depth look at these mid-range and high-end graphics card offerings sporting custom features like Eyefinity, Geometry Boost and Power Tune technologies. Sandeep Gupte, AMD’s product management director, introduced the new graphics cards during the one-day event and stated they will “deliver productivity and performance to professionals regardless of where they are working.” This is an interesting statement, but AMD is committed to providing graphics solutions beyond professional workstations to include mobile workstations, tablets and thin clients to increase productivity and performance across various form factors and operating systems. Last year’s FirePro lineup helped AMD increase their unit share by six points in the professional graphics market. This share increase puts them at about 16 percent overall, which was also supported by sales with Tier 1 OEMs like HP and Dell. This percentage of market share has improved over the single-digit shares AMD experienced in this market back in 2007. Hit that "Read More" link below for the full story! There exists a breed of video card users who want power, but not in games. They will pay thousands for the best hardware and not measure success in frames per second, but seconds per frame. There exists: professionals. AMD, NVIDIA, Matrox, and others cater to this market’s desire for top performance, features, and reliability in content production, scientific simulation, and engineering applications. AMD just recently updated their professional line with the V5900 and V7900 cards and are lauding some advantages to going red. Professionals have standards: Be efficient. That is all. 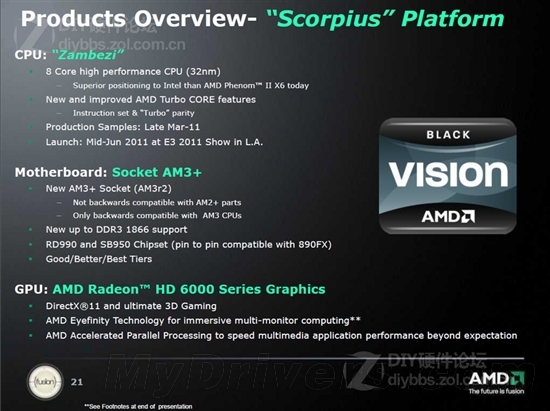 There are four main points that AMD boasts for their latest entries into the professional market. Geometry Boost: doubles the amount of geometry that can be processed per clock by the card which should make using large models a smoother experience. EQAA: a new method of antialiasing which allows graphics cards to raise the level of antialiasing, but only for part of the process, and provide quality close to the higher level with a performance hit only slightly larger than the lower level. NVIDIA had CSAA, which is almost identical, for a while though. PowerTune: a method of raising and lowering the clock rate of various components of the card to compensate for the differing load across the card at different times. Single-card triple-monitor: the ability to connect more than two monitors to a single single-slot card allows professionals to have three (or four for the V7900) displays saving money, heat, and space. This is possibly the most compelling feature of the entire line, especially for the professional market. No ATI to be seen here folks. Obviously outside the professional market there is little use for graphics cards like these as gaming cards are cheaper and faster than their professional counterparts. For professionals, however, these cards look to be very compelling especially since performance is said to be within the same ballpark of and sometimes exceeding NVIDIA’s $4000 Quadro 6000. Troubles still exist for AMD as some professional applications such as After Effects and Premiere CS5 are partially coded in NVIDIA’s CUDA which will not be accelerated on AMD’s offering. Still, for programs not specifically written for NVIDIA, AMD’s latest offering looks to be very appetizing. Keep an eye out for our review coming very soon. Recently, AMD launched two new AMD Embedded G-Series APUs (Accelerated Processing Units). The two new chips have a TDP rating of 5.5 and 6.4 watts, which represent a 39% improvement in power savings over the previous iterations. The 361mm² chip package is capable of being used in embedded systems without the need for a fan to cool it. The embedded chips include one or two low power x86 Bobcat processors and a discrete class DirectX 11 GPU on a single die. AMD currently has three systems utilizing the new APUs, including a Pico-ITX form factor computer, a Qseven form factor computer, and a digital sign system. Buddy Broeker, the Director of Embedded Solutions for AMD stated that "today we take the ground-breaking AMD Fusion APU well below 7W TDP and shatter the accepted traditional threshold for across-the-board fanless enablement." The two new chips are named the T40R and the T40E. The chips both run at 1.00GHz; however, the 6.4 watt TDP T40E is a dual core chip and the 5.5 watt TDP T40R is a single core variant. Both chips include an AMD Radeon 6250 GPU, a 64KB L1 cache, and a 512KB L2 cache per each CPU core. Further, the chips feature an integrated DDR3 memory controller that can support up to 667MHz solder-down SODIMMs or two DIMM slots. More details on the series as a whole can be found here. Mobile and embedded processors continue to get smaller and faster. Have you seen any AMD powered embedded technology in your town?